Clean and pierce your Russets. Bake for 1 hour or until a fork can go through it. Set aside to cool. While the potatoes are cooking, peel and cube your Purple Sweet Potato. Place into a steamer basket inside a pot with enough water to just not touch the sweet potatoes. Cover with a lid, bring to a boil, then down to a simmer. Cook until they can be mashed with a fork, 15-20 minutes. Set aside. Weigh out 15 ounces of each potato, if you don't have exact, make sure you just have 30 ounces of combined potato. Combine the Russets and the Purple sweet potatoes together in a large mixing bowl. Mash with a potato masher to combine. Add the salt, egg, and nutmeg, stir to combine. Now add in the flour. Mix together until a dough forms. 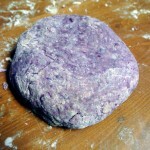 Once it gets started I like to put it onto my work surface and knead it until a ball of dough is formed. You may need to add more flour. Cut the dough into 6 pieces. Roll each piece into a log. Using a bench scrapper or a knife, cut into equal bite sized pieces. Fill a large pot with water. Bring to a boil. Add about a cup of gnocchi at a time, don't overcrowd. Once the gnocchi float to the surface, they are done. Strain and remember until finished with all of them. Melt the butter in a large saucepan over medium high heat. Add in the flour, salt, and white pepper. Then add in the milk. Bring to a boil for 1 minute, stirring constantly. After that minute remove from the heat and whisk in the cheese. Add a combo of butter and oil to coat the bottom of a frying pan. Heat the pan over high heat. Add the gnocchi a couple handfuls at a time, again don't crowd them. Add in some of the sage. Cook until the gnocchi has browned about 2-4 minutes. Remove from the pan and finish the rest of them. I do it in 3 batches. Lightly sauce the gnocchi and serve.